For the late 20th-century confederation between Senegal and Gambia, see Senegambia Confederation. Senegambia, also known in Dutch as Bovenkust ("Upper Coast"), was the collective noun for the fortifications and trading posts owned by the Dutch West India Company (DWIC) in the region now known as Senegal. The main purpose of these trading posts was to obtain slaves in order to ship them to the Americas. The government of the territory was based on Gorée. In 1677, the Dutch lost this island to France. The next year, the French also conquered all DWIC trading posts on the Senegalese coast as well as the island of Arguin. Having lost almost all the trade in gum arabic, bezoar stone, ambergris and ostrich feathers, the DWIC wanted to regain its position. The Frenchman Jean du Casse, head of the Compagnie de Sénégal, reached an agreement with the local leaders, who decided to destroy the Dutch trading posts and the DWIC lost its position for good. 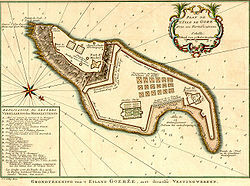 Gorée: 1617 - 1663, 1664 - 1677. With the fortifications: Nassau and Orange. Portudal: 1633 - 1678. Here the DWIC bought slaves and ivory. This page was last modified on 11 September 2015, at 13:03.